Facilitates circulation in blood vessels. Combines natural substances studied for their role in draining fluid from the body. Used for regaining a firmer figure. Water Retention Formula helps maintain the right balance of intra-cellular fluid and contributes to optimal function of the capillaries and lymphatic tissue. ¤ Troxerutin is a more active, recognized form of rutin. A natural bioflavonoid, it facilitates circulation in the blood vessels, microcirculation in the capillaries and venous return. Troxerutin also reduces the capillary permeability and inflammatory reactions that lead to cellulite deposits. ¤ Cacti-Nea® is a 100% natural extract of prickly pear with significant diuretic and antioxidant properties; it facilitates drainage of toxins. Its essential active principle is the fruit’s natural pigment, betalain, comprising 65-85% of highly bioavailable indicaxanthin. - Clinical studies have shown it leads to a significant increase in diuresis, and reduced sensitivity in the lower limbs with decreased sensation of heavy legs and swollen feet, ankles and calves. Cacti-Nea® has a positive effect on fat mass/lean mass distribution and thus on body shape and composition. It significantly reduces water mass with no negative effects on mineral balance or blood pressure. ¤ Elimreal complex® is an exclusive, proprietary blend of plant extracts: carvi, meadowsweet, guarana standardised to 80% caffeine (a classic diuretic for internal and external use), Goldenrod, fennel and dandelion. All these extracts are recognised active ingredients in phyto-therapy that are well-tolerated and have diuretic properties that address the problems of slimming as a whole. Double-blind clinical studies have demonstrated Elimreal’s efficacy in increasing urination frequency and volume, reducing the sensation of heavy legs, increasing that ‘flat stomach’ feeling, improving the sensation of drainage and detoxification, inducing an anti-water retention effect and refining body shape. 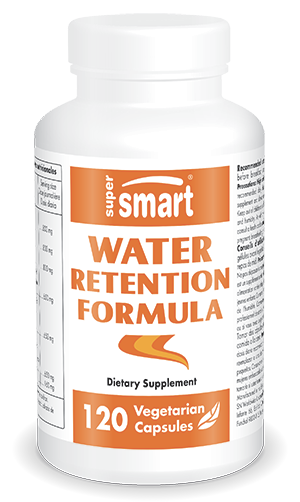 Water Retention Formula combines natural and powerful active ingredients supported by science, that together eliminate the build-up of excess fluid in tissues, remove toxins, and reduce fluid seepage and fatty deposits, to safely achieve a firmer, more svelte you. Adults. Take two capsules before breakfast and two after lunch or dinner. High caffeine content.